Epic users, you’re all safe ! 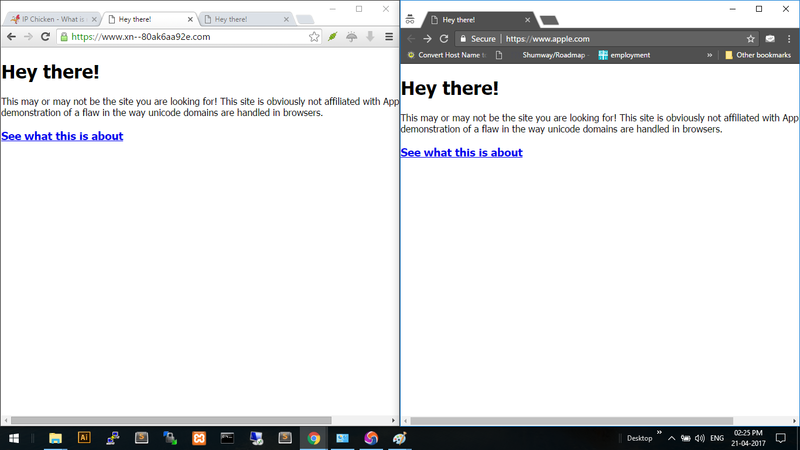 If the address bar says Apple.com as it does in Chrome and in Firefox, then you’re vulnerable. Google and Mozilla have known about this bug since late January but yet to rectify it for the billion or so Firefox and Chrome users. It’s a relatively simple issue to fix so it’s mystifying why Mozilla and Google would delay or refrain from protecting their users from potentially devastating, undetectable attacks that could steal their banking and other login credentials. Here’s an example of the exploit. Epic Privacy Browser is Safe on the Left. Chrome on the Right is Vulnerable. For any concerned internet users, it’s an ideal moment to try our Epic Privacy Browser which is immune to the Punycode exploit. We take security and privacy extremely seriously — all Epic users are safe! The Epic Privacy Browser is the world’s only comprehensive, private and secure web browser. Epic is built on Chromium and blocks ads, trackers, Google tracking, and many fingerprinting techniques. Epic includes a built-in free, unlimited VPN (our encrypted proxy) with eight countries (Germany, France, the UK, the Netherlands, Singapore, India, Canada, and the US) to choose from for Windows users. We protect hundreds of thousands of users around the world every single day. Epic takes less than a minute to install and is a free download via epicbrowser.com — give it a spin and let us know how it feels to browse privately and securely! Thanks Epic for protecting me…from Germany & have loved your browser for years now . Keep up the great work. Punycode how to work although this is exploited billion Chrome and Firefox. So what is this mean? It is one of the best browser. Please keep up the good work.I doubt sometime that my browser is not safe.As some searches using duckduckgo.com fetches results which are ‘from people I know’. Is there any webbrowser driver of epic to be used with Selenium?